To celebrate the Kurdish New Year, Dashni and her family found a beautiful outdoor area to go for a picnic. 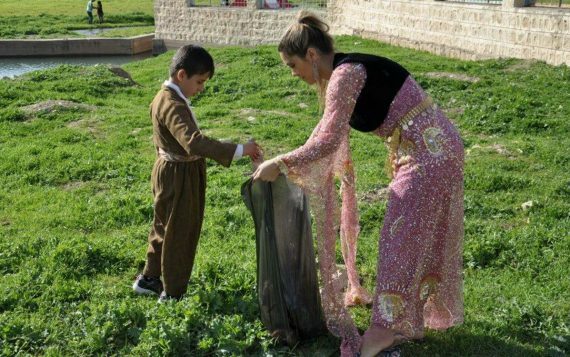 However, the area had become so littered that Dashni was inspired to take some time out of her celebrations to clean up the area, so that her family could enjoy the true beauty of the surroundings. Afterwards, she posted their work on social media, so that they could raise awareness of the issue – showing that no matter where you are, or what the occasion is, it’s important to respect the nature and environment as a priority, before you can enjoy it. Families around them began to join in with the clean-up, making the task quicker – and more fun – and ultimately making it so much nicer to look at the lake. After the hard work, Dashni began a sing song with the families to celebrate their achievement.